the ability to lift your intake in a very simple way without rotating it is an extremely appealing idea. For instance, in the finals of the 2010 World Champs (Clean Sweep), all three robots in the winning alliance used a four bar linkage, and for 2011 (Round Up), 5/6 of the finals robots used a four bar. mounted at the top of your 18” robot, and lifts to 135 degrees, a rotation on 90 degrees, in theory it could reach that high. However, there are many reasons that a four bar cannot do this; for instance it is practically impossible to get the pivot of your arm at the top corner of your 18” robot, and in many cases it is not practical to have the end of your arm in front of you intake, e.g. if you have a claw mechanism. The main problem, however, is that your top arm cannot reach the ground, and the closer you bring your bars together, the less stable your lift will be. Combined, these factors mean that it is very difficult to make your arm reach even 30”. But wait, aren’t there 30 inch goals this year? Luckily for all the high school teams, College teams have been playing with 30” goals for a while as there were 30” goals in College Round Up. The teams found many solutions to this problem, such as combining sliders and a four-bar on one robot, or having LOTS of linear slides. However, the solution that AURA used to much success is one we call the six-bar linkage. A six bar linkage is basically two four bar linkages superimposed on top of each other. What it does is effectively make a four bar where the top bar can go all the way from the top corner of your robot to the ground at the bottom of your robot. This allows your arm to be several inches longer than a four bar, and allows a reach of beyond the magical 30 inch mark. 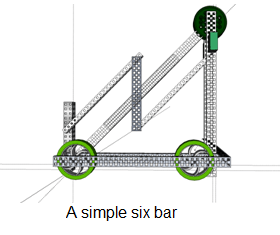 A six bar can theoretically be powered in one of three ways; either through both bars as a normal four bar, through the middle bar only, or through the bottom bar only. The bottom and top bars are mainly to keep your intake from rotating, however it is possible to have the bottom bar powered. It is beneficial in some ways that you do not power only the bottom bar, as the force will have to be transferred through several joints, which can cause greater friction in your lift. However, if you power only the bottom bar, the pivot of the middle bar on the six bar can be at 18”, as it does not need to be bolted to a gear, etc. This can give you extra height, if for some reason you need to lift higher. The next question is how much power do you need on a six bar? Compared to a four bar, the main difference is that the intake is being lifted at a greaterdistance, and therefore has a greater torque effect on your arm. In our case, the distance was so large that our robot actually found it easier to lift goals than its intake. An easy estimate would be to say that you would need about 15% more power on a six bar than the traditional four bar lift. Of course, this varies hugely on the weight of whatever you have on the end of your arm, more so than a four bar, as the weight is being held at a greater distance. The last thing to consider is that there will be a greater force on all the components in the lift. We burnt out several motors and broke teeth off high strength gears. Remember to build everything in your lift system very sturdily, and use plenty of power in your lift, otherwise you will have problems as we first did. I hope that anyone that uses a six-bar has success with it. If you have any questions about it, please do not hesitate to ask, either by email at cameron.edwards@aura.org.nz, by PM on the Vex Forums, or by posting in the thread everyone can see the answer to your question. P.S. Here are two videos of our six-bar robot, Fush/Chups, in action!